We will never get through to most western liberals with our arguments because not only are hard-line anti-Zionists immune to reason, we’re not even making the right arguments for the center. We all understand that there is a radical vocal element, primarily on the left in the west, that is entirely irrational on this topic and who will despise Israel no matter what it does or fails to do. Those people cannot be reached. It does not matter how many times Israelis zoom into Haiti to save lives, people like, say, “Lefty Coaster” on Daily Kos will always-and-forever despise the Jewish people and, thus, despise the Jewish State of Israel. I am less worried about people like him, I think, than in the political ideological middle. It is the well-meaning center that concerns me. Your average American liberal Democrat. This is a demographic that is highly significant in the American context and anti-Semitic anti-Zionists have been gnawing on them for many years, now. For the moment, liberal Democrats are maybe 50 / 50 in favorability on Israel and those numbers are probably eroding. If there is a segment of American society that can be reached via reason, however, this is the segment. Liberal Democrats in the United States traditionally prided themselves on their capacity for reason, even in politics, so let’s give it a whirl. In a recent video of Caroline Glick discussing her book The Israeli Solution she made the following argument, among others, and it is an argument that goes right to the core of Jewish relations with the liberal west. We look at liberal Democrats (or western progressives, more generally) and we think, “Gee, there is no more liberal and progressive country in that entire part of the world than Israel.” And then we wonder how it is, therefore, that Israel does not have much support among western progressives? On the contrary, western progressives are far more suspicious of Israel than are their conservative counterparts. How can this be? Progressives are pro-feminism and Israel has the best feminist record, by a long shot, than any country in the entire region, if not the world! It does not matter, you stole their land. Yes and let’s talk about Nobel Prize winners in science and medicine, shall we? Did you know that Israel has done more, in a shorter period of time, to advance scientific and medical knowledge than any other country in human history? And ethics in war? Antisemites spread the blood libel by suggesting that the IDF specifically targets civilians, particularly children – as Lefty Coaster does in the link above – but the fact of the matter is that the Israeli military forces do more to avoid civilian casualties than any army in the history of warfare. Alright. Alright. Let’s talk about who is inclusive and liberal and who is exclusive and authoritarian. The Palestinian-Arabs want absolutely nothing to do with Jews. Period. The Arab-Muslim State of Palestine needs to be entirely Judenrein. The very idea of Jews living in Judea is an abomination. Meanwhile, in Israel about 20 percent of the population is Arab and Muslim. They have greater civil liberties than do Arabs and Muslims anywhere else within the entire Middle East and elect their people to the Knesset. You get the idea and Glick is absolutely correct. If even we agree with the reality of a concept known as “The Occupation of Palestine” then we have no case. Period. End of story. If Israel is occupying “Palestinian” land then we should just pack it up and go home, because there is no argument to be made. If the truth is – as the Palestinian-Arabs claim and as their western-left supporters agree – that white European Jews marched onto Jewish land and snatched that land from the indigenous Arab population then history should bare this out. Thankfully, history tells us a very different story. The eastern coast of the Mediterranean has no more indigenous people than the Jewish people. We were there thousands of years prior to the Arab conquests. We were there, in no particular order, before the Romans or the Persians or the Babylonians or the Brits. There are no other people on this planet, from an historical perspective, who can lay greater claim to the Land of Israel than the people of Israel, the Jewish people. Is there really any argument to be made that this is untrue? Can, for example, San Francisco State University professor Rabab Abdulhadi – who is building an academic career based on spreading hatred toward Jews among liberals and progressives – honestly argue that Jews have less claim to Judaea than do Arabs? Arabs conquered and now control 99.9 percent of the entire Middle East and it is somehow unjust that the native Jewish population hold onto any portion of our historic homeland? It is entirely absurd, but this is the poison that they are selling. The best and most straightforward manner of dealing with this nonsense is to remind western liberals that Israel is Jewish land. Just as France is French and England is English and Portugal is Portuguese and China is Chinese, so Israel is Jewish. The very word “Israel” means the Jewish people. Now, unlike France, England, Portugal, or China, we are willing to share that land, but no one can tell us that it is not Jewish land. And that, my friends, needs to be our clear and obvious red-line and we need to bang it into their skulls. And Jerusalem will remain united under Israeli rule. Previous Arlene in Israel – A Day Later. Next OzTorah: Torah reading – Chayyei Sarah. 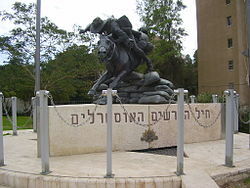 “Clearly, all those who expended efforts, and who stood and stand at the head of, and represent the State, all stress and proclaim that it is a state which was founded in 1948 in the lands which the British abandoned, or from which the Haganah expelled the Arabs (or that they encountered no opposition upon taking over). Twenty-two nations of the world (including the communists in the Security Council — who were among the leaders), decided among themselves to approve the establishment of the state in territory which falls partly in the Land of Israel, and partly outside of The Land of Israel. My answer to all this is simple: It is all inconsequential. None of this is new; except that in 1948 an important part of the Land of Israel was liberated (by the way, they conquered a certain part from outside of the Land of Israel, which was annexed onto the main part — the Land of Israel). The history of the Land of Israel did not begin in 1947. Its modern history began in 1920 with the San Remo conference and the Treaty of Sevres as unanimously endorsed by the League of Nations in 1922 when 99.99% of the captured Ottoman Empire territories were set aside for Arab self determination and just 0.01% for the Jewish people to “reconstitute the Jewish National Home”. There was then no indigenous Palestinian population – only Jews and “existing non-Jewish communities”- whose civil and religious rights were not be prejudiced. The wonder of Arab propaganda has been its success in blotting out all memory of the developments that took place in the Land of Israel between 1917-1948 and claiming the Palestinian Arab population alone has the right to ownership of the Land of Israel as belatedly claimed by them in 1964 in the PLO Covenant and in 1988 in the Hamas Charter. Israel and those interested in its survival have a lot of work to do to make up the lost ground. Maybe its time that the terms “Land of Israel” and “Judea and Samaria” became part of the political discourse. Here’s one of their answers: You’re not the “real” Jews. I keep forgetting that eastern European Jews, such as myself, are actually Kazars. I like very much Caroline Glick but this time she seems out of argument! Whatever antisemits say HAS NO MEANING. Ok presently they say a lot of “you stole their land” but they could just say “you stole the sky” they just don’ care to rack their brains and repeat the same nonsense. I don’t say arguing is useless,it is necessary but that 5-10% of the POLITICAL ARGUMENT WHICH PEOPLE UNDERSTAND AND WHICH IS VIOLENCE. Tahe the land and expell them and YOU WIN AND THAT IS IT! No one will question your deeds any longer. WHY DO JEWS ALWAYS WANT TO ARGUE AND PERSUADE PEOPLE WITH WORDS? words,words and still more words PEOPLE DO NOT CARE FOR THEM! Words are necessary just beef up the talk not to…WIN! TO WIN IT TAKES ACTION!!! Expell arabs to jordan and…EVERBODY WILL SAY YOU ARE RIGHT AND YOU SHOULD HAVE DONE IT FROM THE START!!! Is it so difficult for Jews to understand that??? Robert thank you for joining us. If you only knew how many of us agree with you. That’s why there is such a big move on “Jordan is Palestine” There are a number of Facebook groups by that name. Mudar Zahran, is a Palestinian Arab, who is the leader in exile, also says that “Jordan is Palestine”. Join his FB group. Arlene Kushner, one of the driving forces behind this movement publishes here. In oher words if I was not sufficiently clear : THE WORLD DOES NOT TELL US YOU STOLE THEIR LAND BECAUSE THEY BELIEVE IT BUT TO FORCE US GIVE IT TO THEM. This is tricky of course but what is not tricky with arabs and leftists who USE LIES AS A WAR WEAPON. I’ve had the same issue where liberals claim I am a white Zionist European conqueror yet my last name is cohen which is Hebrew origin, my DNA shows j p58 paternally which comes only from the middle east and not Europe and have the apperance of a middle eastern/east med person . its funny the Europeans told us we are aliens to Europe and Immanuel Kant even called us Palestinians amongst us in the 18th century now that we return to our indigenous land we are told to leave and are colonizers. They can’t make up their mind but history shows from Babylon to the romans to the byzantines to the Arabs they always wanted us out of Jerusalem and the land of Israel. All our enemies worked together to remove us.